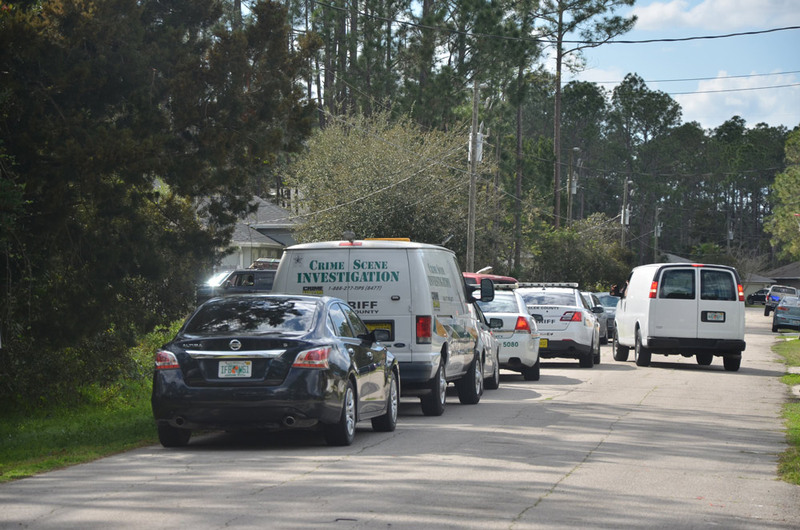 Last Updated: Sunday, 4:58 p.m.
Flagler County Sheriff’s detectives, deputies and the Crime Scene Investigation units spent most of the day Saturday investigating the death of April Descartes, 39, at 37 Robinson Drive. Descartes owned the house there. The sheriff’s office is describing her death as suspicious. “It was suspicious in nature because of her age,” a sheriff’s spokesperson said. “I don’t know anything other than that.” Sheriff Rick Staly was at the scene this morning, as he usually is at suspicious death scenes. But death investigations are routine even when the cause of death is a suicide. “Any time we have an unattended death, especially of a younger individual with no doctor willing to sign a death certificate, we’re going to investigate seriously until we determine otherwise,” Staly said in an interview late this afternoon. An “unattended death” means the victim died without someone present in her immediate whereabouts, though that doesn’t mean there couldn’t have been someone elsewhere in the house. The 911 center got a call reportedly from April Descartes’ father in the morning. Descartes’ father lived in the house, according to neighbors. “There was no one in the room, at least that we’re aware of,” the sheriff said. 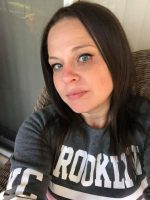 Staly would not elaborate on the manner of death, saying the medical examiner will provide that in the next few days, unless it must await a toxicology report, which could then take from two to three months. But he reiterated that her age and other circumstances compelled detectives to thoroughly gather evidence, since they can’t go back after time has passed to do so in case the death is determined to involve foul play. Neighbors last saw Descartes around 6 p.m. when she came out as her husband, Paul Descartes, and the neighbors were in an argument. 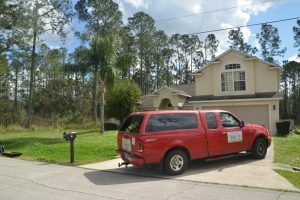 Mabel Taylor, one of the neighbors at the house next door, said she had complained to Paul about his driving his work truck over her lawn, as Paul is in the habit of parking his truck in the back yard, ostensibly to avoid being cited by code enforcement (Palm Coast disallows parking unveiled work trucks in residential neighborhoods.) The argument got heated between Paul and Taylor’s husband, with April trying to calm down Paul, Taylor said, and deputies were called to the scene. “They came, they went to talk to April, but they never came back to talk to us,” Taylor, who’s lived at the house next to the Descartes’ since last May, said, adding that Paul had left the scene before deputies showed up. Neighbors across the street said they’d heard the same argument, and that their son had heard it over the sound of his car radio as he was outside–until he came back in for fear that the argument would escalate so much that he could be in harm’s way. Paul Descartes owns a pressure-washing and handyman business. His truck was parked diagonally across his driveway early this afternoon. Taylor said she’d seen him leave the house as she was smoking outside, around 2 a.m., after being woken up by what she described as a “pop” about 20 minutes earlier, then hearing continuous pounding noises she attributed to a gator behind a backyard fence. (A canal runs by the backyard.) But she said she’d never heard that sort of noise before. Deputies began arriving at the house sometime between 9 and 9:30 a.m., Taylor said, while Paul returned after that and immediately sprang from the car, saying he wanted to see his wife. She said deputies tackled him, brought him to the ground and cuffed him. Early this afternoon, Paul Descartes was sitting outside by his garage door, without handcuffs or any form of restraint, in conversation with one or another detective as a deputy stood by the whole time. 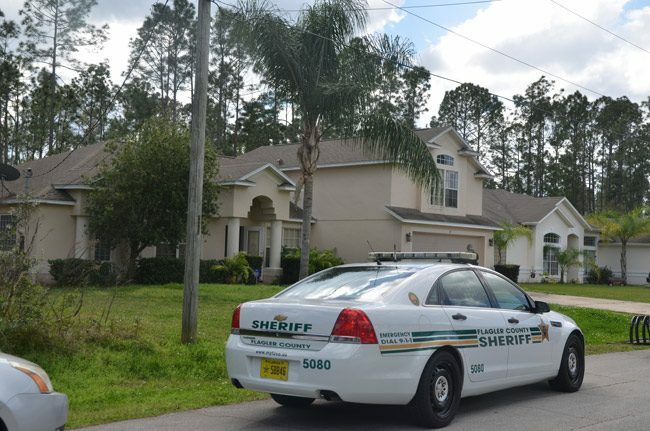 In an interview Sunday afternoon Descartes said he’d been brought down by deputies at first because when he drove up to the house and saw the CSI van, he knew something had gone wrong and he wanted to see his wife. Deputies did not want him contaminating what at the time was an active crime scene. “Me and my wife did not have a physical fight,” he said of the night of her death. “My wife passed away. She died in her sleep.” Paul Descartes said he and April had been married over two decades. They were going through a divorce, but were trying to work things out. “I was doping everything with my wife to get her back,” he said. “I love my wife dearly, dearly.” They have five children together. On Friday he said he was with his children elsewhere. She called him nine times, he said, and he told her he’d be over. He came over. There was that argument with the neighbors, but Paul said the argument is only the latest in an issue that developed with the same neighbors about a month ago when he said he “made a report” with the sheriff’s office over what he says was inappropriate behavior by the neighbor’s child toward his child, a report that upset the neighbors. He said he left and returned to the house after his wife had gone to sleep, stayed with her in their bedroom until about 2 a.m., and left again to be with his children. He was planning to bring the children to the house the next morning. April’s father, he said, left a message on his phone: “Don’t bring the kids, don;t bring the kids, call me, call me.” He drove over and saw the crime scene. Paul Descartes said there were “no scratches, no scrapes, no bruises” on his wife–nor on himself (detectives took pictures of him). Asked directly what he thought had happened to his wife, he said, “I don’t know, I couldn’t even tell you.” He said “my wife would have been mother of the year until her mother passed away” a few years ago, but since then she’d been different, more disconnected from family. Today, he and his children went to his church, New Found Favor Ministries in Hastings (it used to be in Bunnell), where he is a deacon. “All we’re going to do is pray for mommy,” he said he told his children. Early Saturday afternoon a detective at the scene said it was not yet known how the victim had died. Asked if a gun was involved, the detective said there was no evidence of a firearm. The medical examiner arrived at the scene shortly after 2 p.m. Saturday The medical examiner’s van that was to remove the body arrived at 2:30 p.m. as detectives and others continued to work inside the house. At the time there’d been nine law enforcement vehicles lining the road, some of them unmarked. By 3:30 p.m., only two marked deputies’ vehicles remained as a daughter of Descartes’, who had learned of the death, cried in the yard. my heart goes out to the family, so sad. So sad! I work at Hammock Resort also. Prayers go out to her friends and family! Forensic toxicology testing in real-life time vs. cop-show time. Two different animals. I’m sorry for Angelina which was April’s daughter I know we had beef but I feel bad and I am here for u so if u need anything in here for u and don’t worry I care so if u need anything HMU ❤️🤞🏻From Emily and also remember she is in a better place and she will always be with u now no matter what ! In a better place? What an insensitive remark. How is being dead better than being here, alive and with her children? I suppose you think that this happened for a reason too. For those of you who have never lost someone close to you, let me be the first to tell you, people who are grieving don’t want to hear these things. Little bit of hate there in ya Willy Boy? You sound so intelligent. Condolences to the Family,She was always in a Happy Spirit as she came thru The Main Gate at the Resort the few times She would speak..God Cover this Family during this time and Let them know that all the answers to the questions they have will come from you..